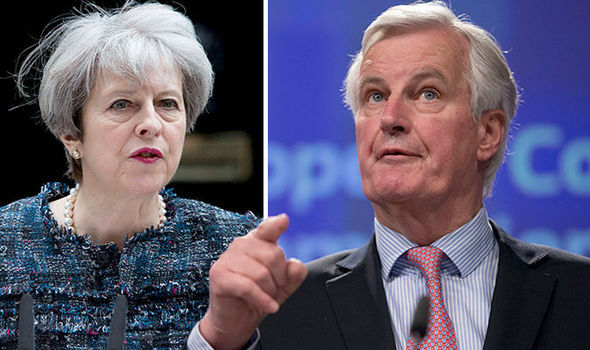 MICHEL Barnier has warned of the prospect of an “explosive” political crisis if Britain leaves the EU without paying a multi-billion pound Brexit bill. As Brussels bureaucrats take an increasingly hard line stance in their approach to Brexit talks, the EU’s chief negotiator warned the bloc could face major problems if Theresa May resists demands to pay a divorce fee, rumoured to be around £85billion (€100billion). EU leaders have suggested that the Brexit bill would simply be a case of ‘settling the accounts’ and forcing the UK to honour previous commitments. Mr Barnier has warned that the EU could face an 'explosive situation' if Brexit talks deteriorate. Branding the payment “incontestable”, Mr Barnier said: “Imagine what would happen if this were not to take place. Britain’s net annual contribution to the EU - which stands at around £8billion - represents a large proportion of the Brussels budget and member states must now establish plans to plug the financial hole that Brexit will leave. After the Financial Times reported the EU has increased its Brexit bill to an eye-watering £85billion (€100billion) after France and Germany made stricter demands on how much the UK should pay, Brexit Secretary David Davis rejected suggestions that Britain would be willing to pay the eye-watering sum. After news of the huge bill emerged, the Prime Minister accused European politicians of making “threats” and meddling in the upcoming General Election. She said: "Britain's negotiating position in Europe has been misrepresented in the continental press. "The European Commission's negotiating stance has hardened. Threats against Britain have been issued by European politicians and officials.